The Phizzing Tub...: Happy Father's Day! I hope you are able to enjoy the day as you would like. 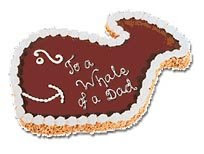 BTW- That cute little picture is Fudgie the Whale; it is a cake from Carvel Ice Cream. Growing up in New Jersey (as a young child & later as a teen), I clearly recall founder Tom Carvel selling his ice cream cakes on TV. I was able to find one of the commercials for you to watch. Now how can you not remember that?! That's hilarious and fudgey the whale looks dilicious.